Jon Stewart may have left 'The Daily Show' but his debut directorial feature 'Rosewater' (★★★★) reflects some of his tenure as presenter. Stewart presents the story of Iranian-Canadian journalist Maziar Bahari, imprisoned for allegedly working with the West to incite revolution during the 2009 Iranian election - his satirical appearance on Stewart's TV show one of the pieces of evidence used against Bahari. Stewart has adapted Bahari's own account of his brutal imprisonment, injecting a level of humour that does not detract from the gravity of the situation, instead highlighting its increasing absurdity. Gael Garcia Bernal portrays Bahari, and while he offers a strong performance veering between deadpan wit and desperation, there is a sense that a Middle Eastern actor may have been a more prudent casting choice. Thankfully, the film's final note is pitch perfect, mentioning the plight of other "dissidents" unjustly persecuted. 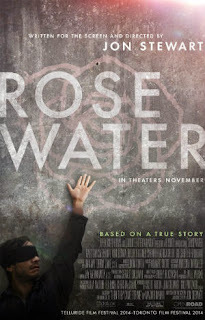 'Rosewater' is released in UK cinemas on Friday 8 May. Kurt Cobain's legend has been inescapable in pop culture since his suicide in 1994, and 'Crossfire Hurricane' director Brett Morgen offers his take on Cobain's story in 'Montage Of Heck - out now on VOD, Blu-ray, and DVD. Thanks to the support of Kurt's daughter, who is also executive producer, we receive the benefit of unparalleled access to family members and unreleased home video footage in this engrossing docu-drama. Morgen traces the journey from happy-go-lucky toddler to troubled rockstar, by way of a rocky adolescence - particularly illuminated by incredible animated interludes led by Hisko Hulsing. Sources of Cobain's misery become increasingly apparent, but we also bear witness to a softer side to Cobain's volatile, drug-addled relationship with Courtney Love. Bandmate Dave Grohl is an unfortunate absentee but this remains a compelling portrait of an enduring teen icon. Journalist Charlie Lyne is perhaps best known for his irreverent film blog UltraCulture, which is on intermittent hiatus as he pursues a career in film. His opening number is 'Beyond Clueless' (newly available on Netflix UK) - a documentary that dissects the golden era of teenage films, in and around 1995's seminal 'Clueless'. Narrated by of-the-era actress Fairuza Balk, Lyne focusses on various themes in his episodic take on the genre, examining the likes of conformity and individuality, hierarchy, and sexuality. Everything from cult classic 'The Faculty' to the derided 'Josie And The Pussycats' comes under Lyne's critical eye, although there is a resulting overreliance on montage which causes the film to drag. 'Beyond Clueless' does however end strongly with an epilogue that matches the sentiment of its chapter-closing content, particularly with a dreamy composition from Summer Camp, who provide a hypnotic soundtrack throughout. 'Suicide Squad' director David Ayer has been revealing more of his forthcoming comic book adaptation, with further cast photos showing off Harley Quinn and Will Smith's Deadshot. James Corden appears to be impressing as the new host of 'The Late, Late Show' and his latest skit sees the British comedian join forces with Arnold Schwarzenegger in a six minute skit compiling some of the latter's finest scenes. "PUT THE COOKIE DOWN!" There's plenty of new images from 'Star Wars: The Force Awakens', with closer looks at Oscar Isaac and Gwendoline Christie, among others. And finally, RIP Keith Harris (1947-2015). His act with Orville genuinely lightened our mood on many an occasion.